For the third quarter of 2017, Apple was once again the leader of the wearable market. 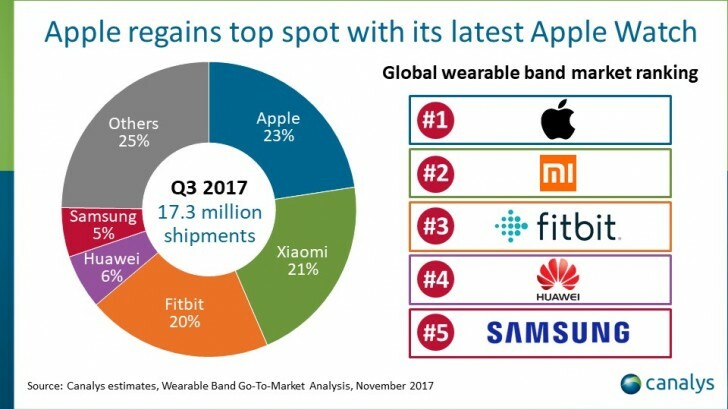 The company making the Apple Watch found itself in that position in Q1 as well, but in Q2 it was overtaken by both Xiaomi and Fitbit. These are still the names in the top 3 - for Q3 2017 Apple leads, followed by Xiaomi and Fitbit. 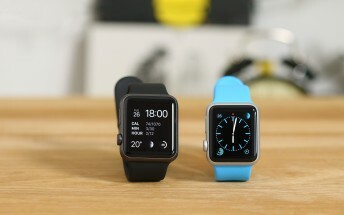 Apple is estimated to have shipped 3.9 million wearables between July and September. Xiaomi moved 3.6 million units during the same time frame, while Fitbit managed 3.5 million sales. This means Apple now commands 23% of the wearable market, Xiaomi has to make do with 21% market share, while Fitbit sits at 20%. Huawei is in fourth place, but its share of 6% means it's unlikely to pose a threat to the top three in the near future. The final entry in the top 5 is Samsung with 5% of the market. The release of the LTE-capable Apple Watch Series 3 clearly helped Apple in Q3, its strongest quarter so far this year. 800,000 Apple Watch units sold in that three-month period were of the LTE variety. However, the Series 3 failed to reach its full potential in Q3, analysts say, because of limited availability as demand was higher than supply. So it should feature nicely in Apple's fourth quarter sales numbers too. While smartwatch shipments have grown, basic fitness bands aren't selling as fast as they once were, and because of this the overall wearable market fell 2% in Q3 to 17.3 million units.